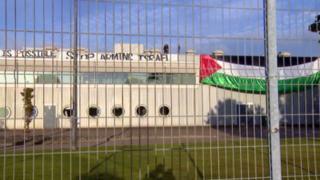 Pro-Palestinian protesters are staging a demonstration at a defence engineering firm in Glasgow. Activists from Glasgow Palestine Action gained access to the Thales Group site, in Govan, on Tuesday morning. They say the firm makes components for drones which have been used against Palestinian people in Gaza. Activists blockaded the entrance and hoisted a Palestinian flag. Police allowed workers into the plant and are now attempting to remove protesters.